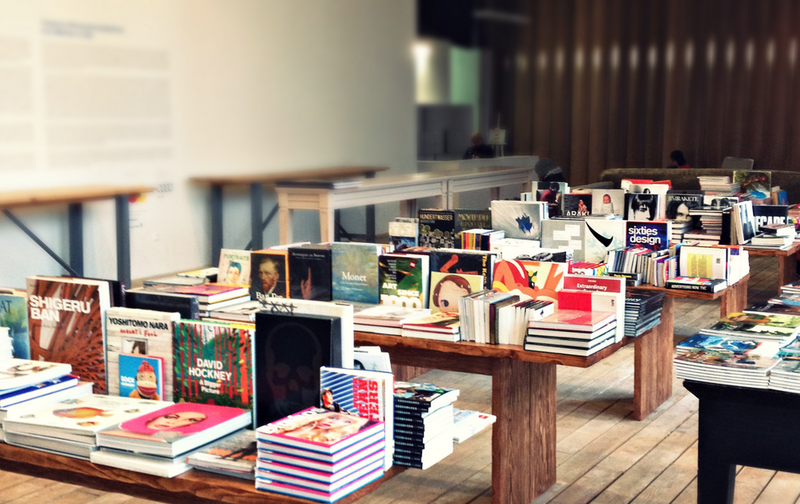 The Bookshop at the Garage Museum of Contemporary Art, Moscow. Amid the doom and gloom of escalating US-Russo sanctions and Contemporary Art galleries closing in Moscow a rare piece of good news is that the Garage Museum of Contemporary Art is to open the first public library in Moscow devoted to Contemporary Art. The Garage, founded in 2008 by Dasha Zhukova, already has an extensive program dedicated to Russian Contemporary Art from the 1950’s with exhibitions, events, education, research and publishing. The Institution is currently based in a temporary pavilion in Gorky Park created specially by the architect Shigeru Ban. In 2015 the museum will move to its first permanent home, the specially renovated 1960’s Vremena Goda (Seasons of the Year) pavilion in Gorky Park which has been designed by Rem Koolhaas. Various of the existing and former Russian Contemporary Art galleries such as XL Gallery, School Gallery and Aidan Gallery have donated their archives. The museum expects to have its collection fully digitized by 2017. Until 1991 many of these artists, if they didn’t follow the official Socialist Realist dogma, had to work underground, and so their records tend to be fragmented or still with their descendents. “For 70 years, people destroyed their own histories” says Kate Fowle, the chief curator at the Garage. The archive will contain the records of the first exhibitions of non-conformist art held in the 1960’s. The archive will have an annual budget of US$500,000 and acknowledges it will have to be careful not to contravene Russia’s new censorship laws. Unnoficial art from pre-1980’s is more acceptable than later art particularly if the subject is offensive to the authorities. The museum will collect such material but may refrain from exhibiting it. The museum intends to interview some 10 artist a year as these artist are rapidly approaching old age. It appears to be focusing on non-conformist art and ignoring the Severe Style artists of the 1960’s which is a shame. Perhaps the Severe Style artists, some of whom are still alive such as Victor Ivanov. Pavel Nikonov and Petr Ossovski are considered by the museum to be closer in style to Socialist Realism than the artists that they are focusing on. But actually the Severe Style artists created a strong independent style that was often as objectionable to the authorities as the non-conformists were. The library would be that much richer if it incorporated the artists of this school and it should get a move on with interviewing them as the few still alive are all approaching 90. I can’t answer for eneoyrve, but I just don’t think it takes any great talent to spatter paint on a canvas (Jackson Pollack) or paint cubes (various artists). How does one discern any meaning to such things? Is is like the ink blots during a psychological exam? How do tell good splattering from bad splattering? It’s much easier to look at a painting that gives you some sort of idea of the message it’s trying to convey.